Home Blog What has entered the school? What has entered the school? Ash believe that a dinosaur entered the school building early this morning, at around 1am. Based upon the evidence in school and research conducted, Ash are certain that it was a t-rex. The footprints discovered in Ash, Maple and Beech clearly resembled those of a t-rex print. The size, as well as three toes on each print, were signs of evidence that this species of dinosaur had been in the school. All signs have pointed towards the dinosaur having fleas. The creature had seemingly been itching its upper leg during its adventure in school, since there were droplets of blood conducive of an over-itch with a sharp claw. The detectives believe the scratches were deep, due to the t-rex shedding skin during its walk around the Infant Department. 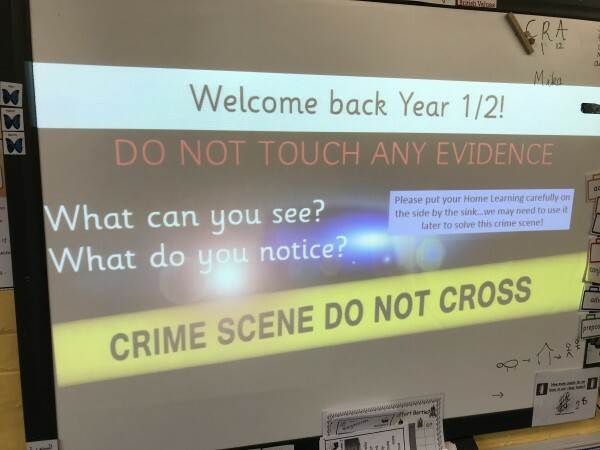 At the end of the day, after accumulating and sharing this evidence with the other classes’ detectives, Officer Hughes received a telephone call. Detectives in KS1, were then fortunate to watch CCTV footage obtained by the police…a t-rex did, indeed, enter the Infant Department!